In his re-election campaign, President Obama says he wants to cut the growth of college tuition in half over the next decade. But he faces hurdles toward that goal over which he has little control, even if he wins Nov. 6: dire state budgets and a gridlocked Congress. The rising cost of getting a higher degree sends millions of students into sticker shock each year, and paying off student debt has only grown tougher. Over the past decade, average annual tuition for a year of community college has risen 40% to $3,122, according to the College Board, a nonprofit group that runs the SAT exam. 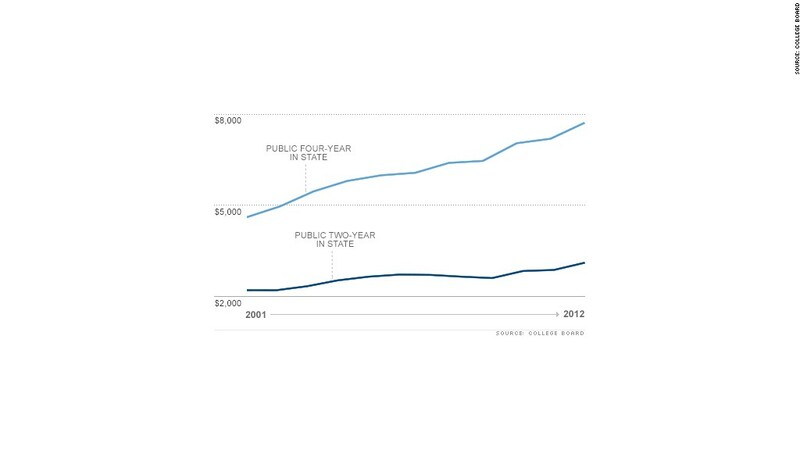 At 4-year public universities, the cost has risen 68% to $7,692 a year. While not impossible, Obama's goal of slowing tuition growth is vague on details and faces harsh realities, education experts say. At public institutions, the big problem is cash-strapped state budgets. As homes nationwide lost value, homeowners paid less in property taxes -- or lost their homes and paid nothing. With states from California to Wisconsin scrambling to fill giant budget gaps, education has been one of the casualties. "When times are good, states are very good to higher education, and when state budgets are suffering they're harder on universities than they should be," said Terry Hartle, chief lobbyist for the American Council on Education. An Obama campaign official said that the president would encourage states to step up with a new grant program that would promote new ideas to cut costs. The program could reward universities for things such as making it easier to transfer more affordable community-college credits toward a university degree. But, the president would need to get Congress on board to fund such a program -- and it was all he could do to get Congress to extend lower rates on subsidized Stafford loans another year. "If Congress wanted to prioritize higher education, there's nothing stopping them from increasing investments in a way to make college affordable and cut the costs of college for students across the country," said Rich Williams, higher education advocate for consumer group U.S. PIRG. One controversial idea Obama proposed this year is -- for the first time -- linking higher education funding to a college's ability to hold costs down. But doing so won't be easy. Since most education funding goes directly to students, such a move would mean stopping students from using their low-interest Stafford loans or Pell Grants at certain colleges and universities. Congress frowns on that, Hartle said. "It would be like the federal government saying you can't use your food stamps at this grocery store," he said. "Congress said they don't like to do this, because it doesn't make sense to give students a voucher and limit the places they can spend it." Technology is the big unknown that could play a major role in lowering higher education costs, and Obama has talked generally about encouraging advances to keep costs down. Many universities already offer online courses, but they're often just as pricey as going to school in person. However, there are signs of progress: massive open online courses, or MOOCs, from Coursera and edX, in which university professors at prestigious institutions offer courses free to anyone with an Internet connection. Right now, students taking such classes don't get credit for those classes. But if they did, the potential blow to higher education costs could get Obama toward his goal, said Andrew P. Kelly, research fellow in education policy studies at the American Enterprise Institute. "Encourage that kind of behavior and wait until the competitive pressure of those guys starts to either compel changes to traditional university behavior or puts them out of business," Kelly said. "That's a systemic broad-based kind of approach that is likely to pay bigger dividends down the road."